On Tuesday 21st June, two teams from Quinton House participated in the Cognita Cricket Festival with brilliant results. 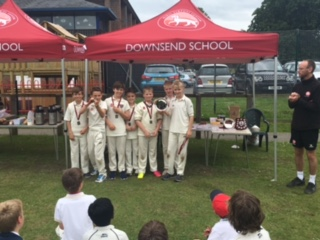 15 boys from Years 3-6 travelled to Downsend School in Surry for a super 6s tournament. Both the under 11 and under 9 teams had difficult groups and started the day apprehensively and slightly tired after the early start and 3 hour drive. The under 11s got off to a rocky start and struggled to score enough runs with the bat. However we came alive in game 3 and 4 hitting well over 50 runs in 5 overs (Zac Mason powering to 17 Not out). These two performances enabled us to gain bonus points and we found ourselves in the shield final. The final was against a strong Clifton Lodge school. We had batted first and scored 43. This is a good score after 5 overs but not safe. Three overs in to Clifton’s innings we were fully aware that they were in front by 5 runs leading into the last two overs. Two very strong overs by our joint captains, Oliver Cherrington and Hayden Ebsworth, enabled us to claw the lead back and take the game by 3 runs. The boys were excellent and enjoyed their medals and silverware. The under 9s had a super start against Oakfields Montessori School. With a run total of 37 we then put in a superb fielding performance. An outstanding bowling performance from Jack Wilch (2 wickets) and several catches meant that we had our first win. Our second game was against hosts, Downsend ‘A’, (the eventual overall winners). This game was played straight after our first, meaning we were not as fresh as our hosts. Despite this the boys put in a good performance against a very strong team. Downsend ‘A’ narrowly won the match leaving us with a win and a loss. This was the end of our group games. Our hard work in both games had earned us second place, and a chance to compete in the shield. We came up against another strong side in Downsend ‘B’. All the boys batted and bowled really well, but chasing a score of 64 was a tough ask. We narrowly lost, but again there were many positives to take going into our final game. We were then drawn into the shield final against Meoncross. On a smaller pitch we found ourselves chasing a total of 64. We knew we had to hit some big shots which eventually led to us being caught out several times. Despite this we performed very well, with Kayden Dixon hitting a big six. The boys were a credit to Quinton House.